Internet Explorer 5.1.7 works in OS 7.6.1! 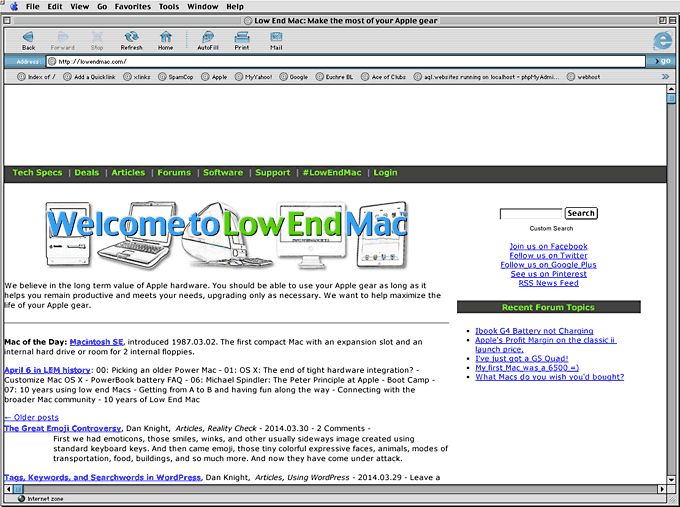 Browsers and email clients are a problem in Mac OS 7.6.1, no matter how fine it is otherwise. I have had a hard time recommending it to my friends, as they are not interested in computers and just want things to work. The ability to get a secondhand Mac that is fast in 7.6.1 for a very low price or free and nicely working software does not count much for a person who cannot check emails or pay bills with it. While waiting a delivery (still waiting) of a Virtual PC 3 to help with the browser/email client issue, I have been testing a bit. The answer is Internet Explorer 5.1.7 – no compatibility issues with the world any longer. According to Microsoft, it should need Mac OS 8.1, but the Appearance Manager make it work, just like that. Magic! Now I can recommend 7.6.1 also for persons who are not looking for a new hobby. My Mac is fastish for an OS 7 machine with a 366 MHz G3 and 352 MB RAM. I have upgraded the OS with help from System 7 Today. I have not had a single reliability problem because of the Appearance Manager, nor has it slowed down my Mac at all. IE 5.1.7 for a browser, SweetMail for an email client, and things just work! Both of these needs the Appearance Manager. SweetMail is the only client for 7.6.1 that can do authentication (and multiple accounts). Unlike some people think, Appearance Manager 1.0.4 does not change the look of 7.6.1. Everything looks exactly the same afterwards, but WindowShade and StickyClick are also included. Nice. You can download IE 5.1.7, SweetMail 2.2r6 PPC and Appearance Manager 1.0.4 from Pure Mac. All three are really easy to install, and this combo has brought me the speed and compatibility of OS 9 in Internet to OS 7.6.1. All other applications are already faster in 7.6.1 than in 9.1 – in my Mac anyway.